Thanks, Soma! I loved making it – especially picking out the colors :)) Thanks for reading! The renewed chairs look amazing! This gives me a great idea for my deck this year!! Thanks for sharing on the Pleasures of the NW’s DIY party! i love chairs too! 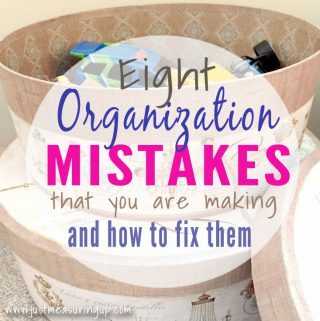 and had one like the shorter one once…..thanks for sharing on craft schooling Sunday! Such a good deal on those chairs. Love the remodel, especially that red one! You two have great skill! 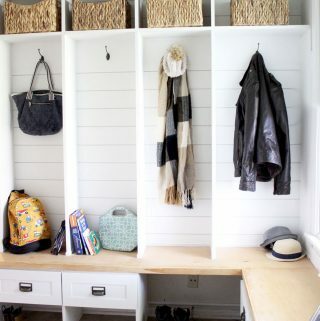 Love this simple DIY! Thanks for sharing! 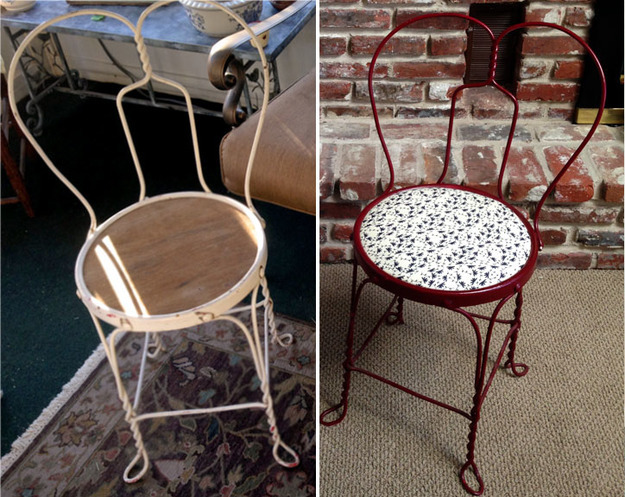 They both look great – I love doing a face-lift with old chairs. These are so adorbs, love the colors and prints! So so cute! I love how both of these turned out! 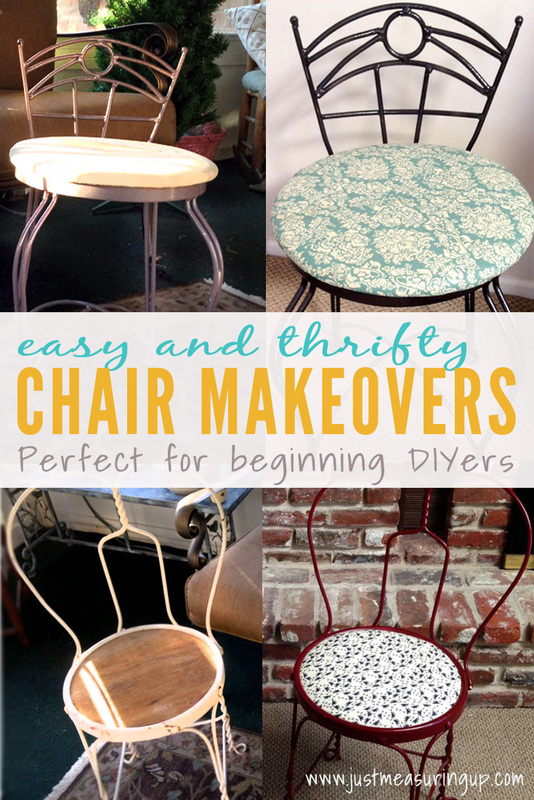 I’ll keep my eyes peeled for some cheap chairs I can redo! Hahaa thanks WebMDiva! 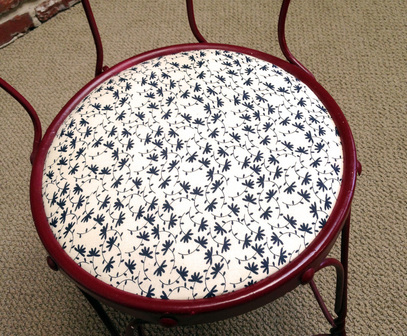 It’s crazy how much of a difference spray paint and new fabric can make:) Me too on the flea markets! 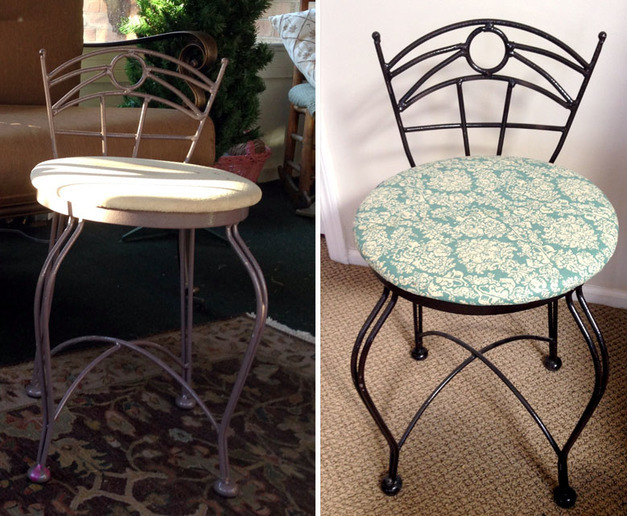 Thank you for showing us how to make our old chairs new again and sharing with us at #OvertheMoon. 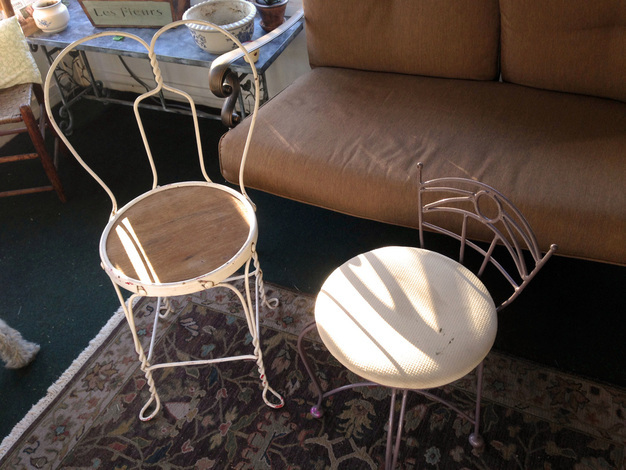 I think both chairs both look much nicer refinished. Its always amazing how much a quick paint job will do. I really liked the contrast between the the blue cloth and the burgundy chair. They both turned out beautifully! I have a vanity chair that had been in my mother-in-law’s home for years and was pretty beat up, but a little cleaning and new fabric over the seat turned it into a great piece for my bathroom. I’m always on the lookout for chairs but never have any luck. I need to shop with you guys! Thank you for sharing with us this week at Celebrate Your Story, have a great week. Great ideas! 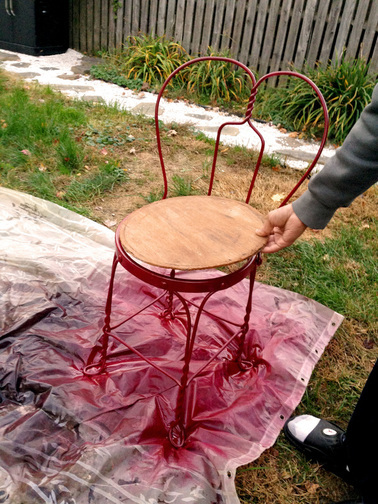 I have a couple kitchen high-chairs that are so stained and need to be recovered. Happy Thursday, from the Sincerely Paula Linkup! Thanks Megs! 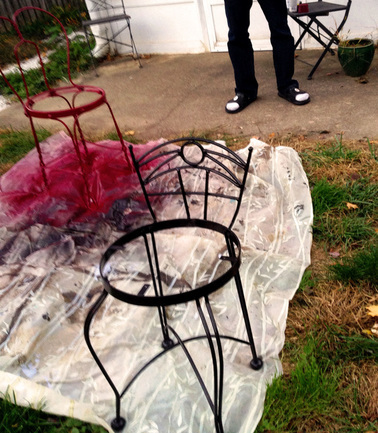 It’s amazing the difference some spray paint and new fabric can make:) have a great week! Fun! I love that you thought of your grandmother when making these over. Sentimental details make renovations so much better, right? 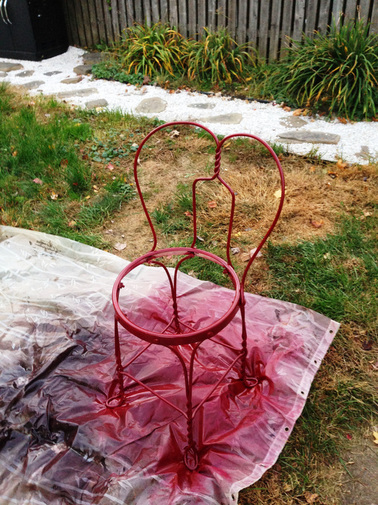 I really love how your chairs turned out. They look great, and I think you did a great job on them. I really like the chairs, and I think they turned out well. You really did a great job! I would love to find some ice cream chairs- I think they are so cute. These are so pretty! 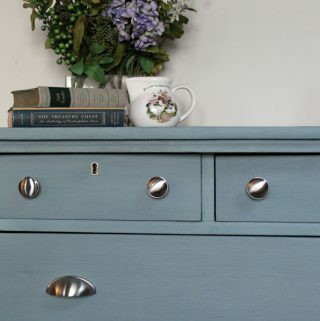 I love making over furniture, it is cheaper and more individualistic than just buying it. A very nice job on both chairs. Amazing what your creativeness can achieve. Aww thanks so much, Kathleen! These are so cute! Thanks for sharing them with us at the Funtastic Friday link party! You are so right about chairs and these are so cute. Great makeovers. I love that these chairs are small enough to fit in a corner and add extra seating when needed. Thanks for sharing at Your Inspired Design. such cute chairs. My mother-in-law has a few but they are in their original state yet great condition. 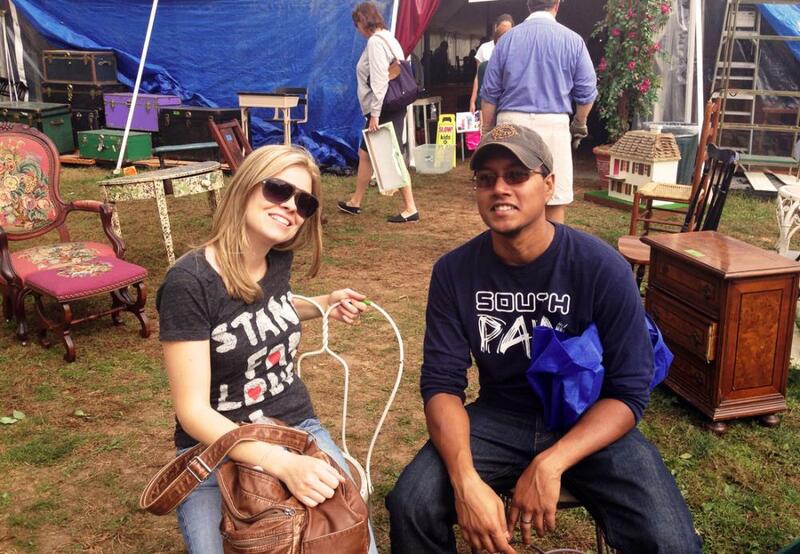 Your chairs turned out beautifully. 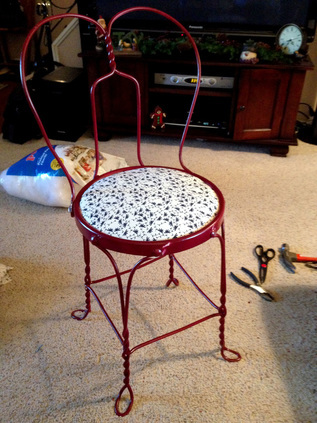 It is always amazing what a little paint and fabric can do to give a whole new look. Thank you for sharing at Vintage Charm. Love the style of both of these chairs! The makeover you gave each of them makes them look even more stunning! Thanks so much, Keri!! Must be why I love chairs lol! Those look fantastic! What a transformation! I want to extend an invite for you to share this recipe at our weekly link party which runs from Wednesday-Monday every week. Hope to see you there!